Hello Friends and welcome to your Long Weekend!!! Happy Memorial Day Weekend! I hope you all have made wonderful plans to celebrate and enjoy your Family and Friends. If your family is anything like mine you are running around from 8th grade promotions, Graduations, school dances and celebrations! One added Blessed event for my family this weekend is the celebration of, my very young Father’s, 80thBirthday, he still runs circles around me! So hard to believe how great 80 can look on some people these days. So pardon my personal shout out to My wonderful Dad, Happy Birthday Papa!! We all love you so much!! Okay, down to the business at hand, if you’ve been keeping up with me on my Facebook page, I’ve already explained my difficulties in bringing you today’s project. Not difficult at all to do, just difficult to photograph!! (Disclaimer here folks, and I’m sure no shock to any of you) I am not a photographer, nor have I ever claimed to be. So when my frame broke on my bathroom mirror and I was lucky enough to salvage this one from my neighbor’s garbage to redo I was ecstatic!! Another NO COST project, right? 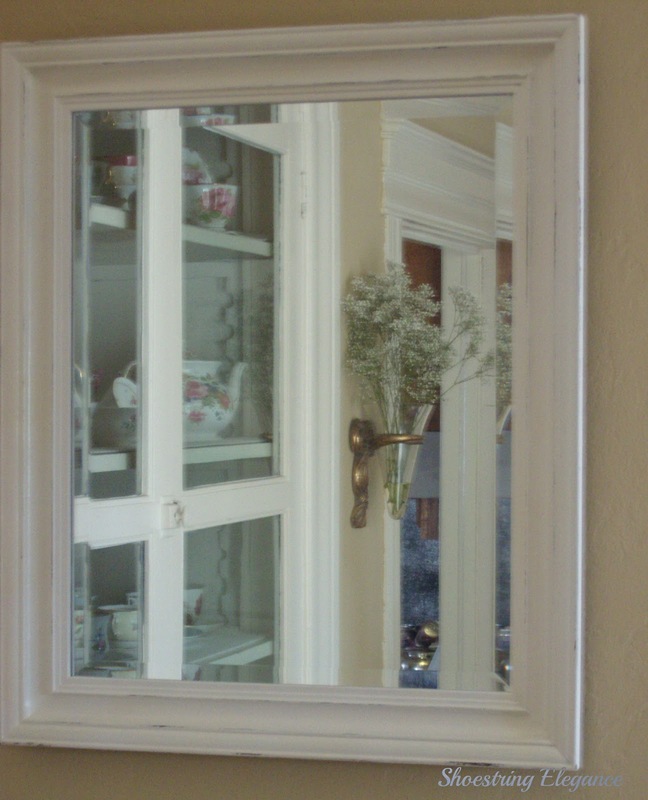 Well yes, I redid the mirror, and it was awful to start, but solid wood. I think it turned out beautiful…I mean I am literally in love with frames now! I had no idea when I secured the mirror in place and put it back in its spot on the windowsill, that It would be completely impossible for me to photograph the mirror and all its detail, to share with you, without my reflection being in it! Ahemm.. 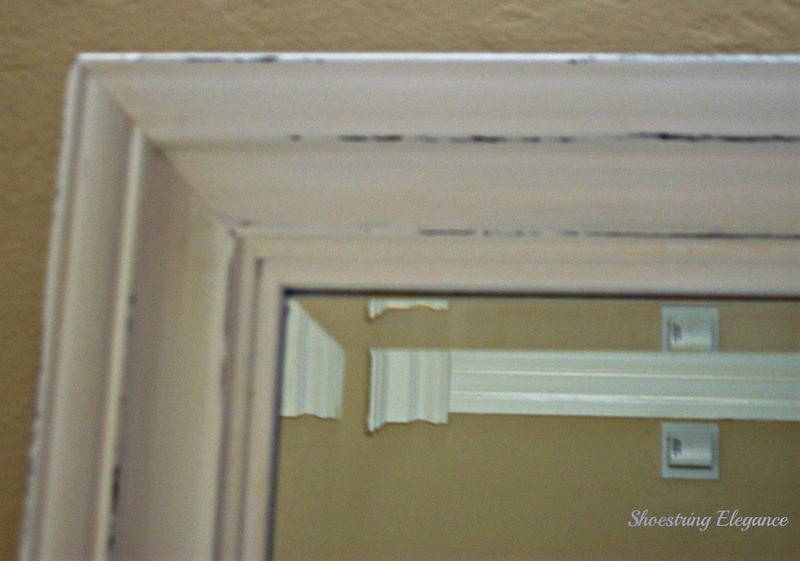 So what you are viewing are some of my feeble attempts to show you my beautiful newly chalk painted and distressed mirror frame! 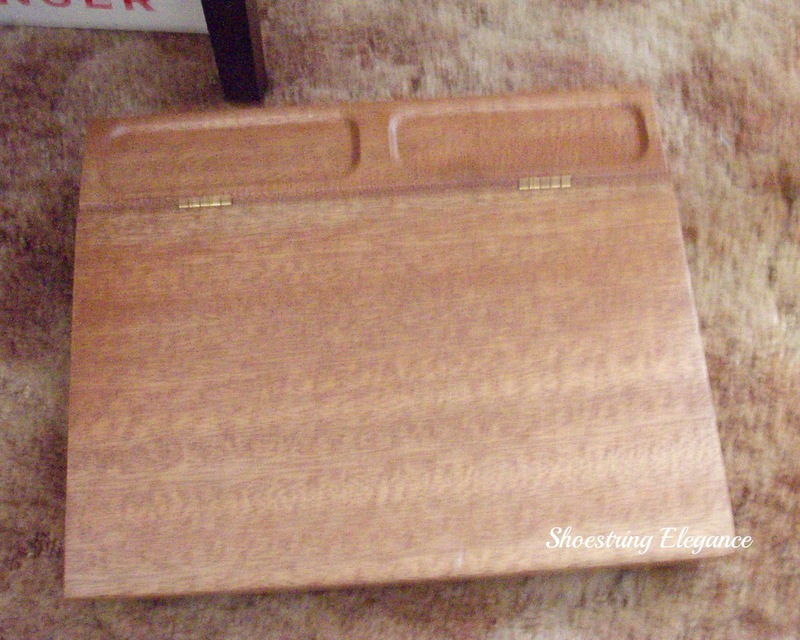 This last one is where it actually lives now in my house!! I hope you enjoyed it!! 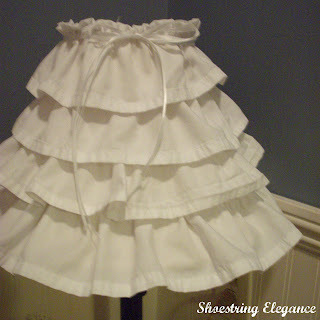 Hey, anyone recognize the ruffled lampshade? I pray you all enjoy a very safe and fun filled Memorial Day Weekend!! 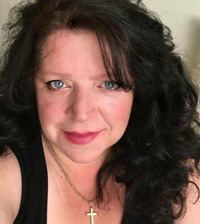 Take a look at who I’m linking up this project with, and if you haven’t already, please go “Like” me on facebook so you can see some extra pictures and some wonderful little tidbits and shares that don’t always make it here!! Many Blessings to you all!! Good Tuesday Morning to you all. 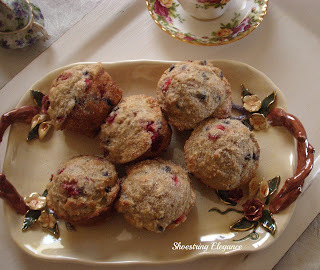 I wish I could have you all over to enjoy a fresh fruit muffin and coffee with me today!! 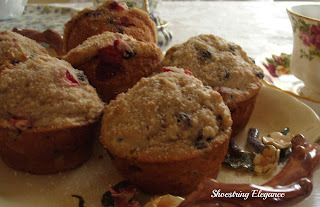 I always love to use whatever is in season this time of year, with my basic muffin recipe, to celebrate Spring!! And as this morning is a little overcast it’s not too hot to turn on the oven! 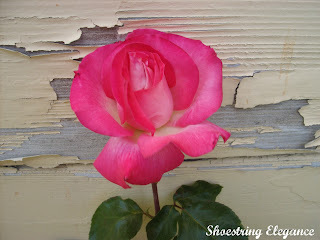 I live in a beautiful, yet somewhat dilapidated, old house built in 1912.. I must admit, as much as I love all the old moldings and craftsman touches, the heating and cooling system are a bit (how shall I say this) archaic. My heating source is, basically, a radiator in a box in my Living room floor. The cooling is a ceiling Fan and lots of windows, accompanied by an oscillating fan on truly Hot days. So you see I must decide if it’s a good baking day or not based a lot on the weather! 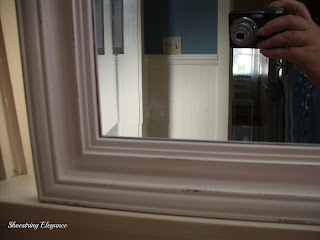 This is not a complaint, I honestly love this old house, but as I am a renter, and can decorate and design as I like, I truly can not do some of the upgrades one doe in a house they own. Ok, enough History and on with the muffins of the morning recipe. I don’t follow a recipe so I’ll share with you how I make them. Well, this week I got a steal on some fresh strawberries and blueberries…any fruit or dried fruit works but why not use what’s in season and affordable? I always start with soaking 1 cup of oats in 1 cup of Low fat buttermilk for about 5-10 minutes before I add anything else. I love the texture and flavor these 2 combined give! To that I whisk together 1 jumbo or 2 reg Eggs ½ cup brown sugar, some vanilla, and 1/3 cup of vegetable oil or 1/2 cup applesauce (depending on your diet preferences) Then, add that to the Oat mixture and stir. (and I do mean stir! With a good old-fashioned wooden spoon!) Now when you add the following dry ingredients, it is important to stir it in just enough, don’t use a mixer!! This is the reason Grandma’s recipes always tasted better, she never took short cuts!! (Not that they were available), If you have a sifter put the following in it and sift over your wet ingredients. If you don’t have a sifter combine these ingredients in a small bowl before adding them to your wet moisture…Stir, no more than 15-18 times! Okay, now you can add your fruit. I did ¼ cup of small cut strawberries and 1/3 cup of blueberries. (Remember to cut your strawberries to about the same size as the blueberries or you will get a soggy muffin.) Let the batter sit while you prepare your muffin tin and preheat your oven to 425 degrees Farenheit. Spoon in tins to about 2/3 full , bake and enjoy with your coffee! I hope you all have a Blessed day!! I’ll be posting my latest project later today or tomorrow so Enjoy until then!! Check out these other wonderful sites while you’re sipping your coffee and going for that 2nd muffin! Good Morning Friends, I hope you all had a great weekend!! I know I sure did enjoy the actual "Spring-like" weather here in Northern California, for a change!! It’s so beautiful to have the garden in bloom and the windows open again, It always seems to take me back to that childhood feeling when summer break was near and all is right with the world. Now, On with the show!! 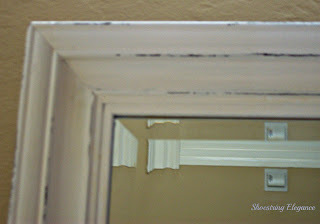 Okay , so, as promised, today is Monday, and I am sharing with you my NO COST new little Romantic Ruffled Redo. I have to say I am in love with how this turned out! If you’ve been following my blog, you may remember the Double Ruffled French Country Cottage inspired Tablecloth that I made out of white sheets, purchased @ the GW.. If you do, great! 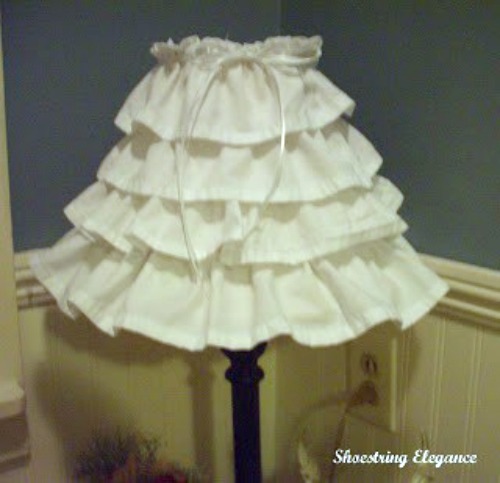 If this is your first time here click on the Link to the right that says April and then French Country Cottage Inspired Double Ruffle..
What to do with all that left over white sheet fabric?? This project was not too difficult and as you can see from the before image very necessary!! 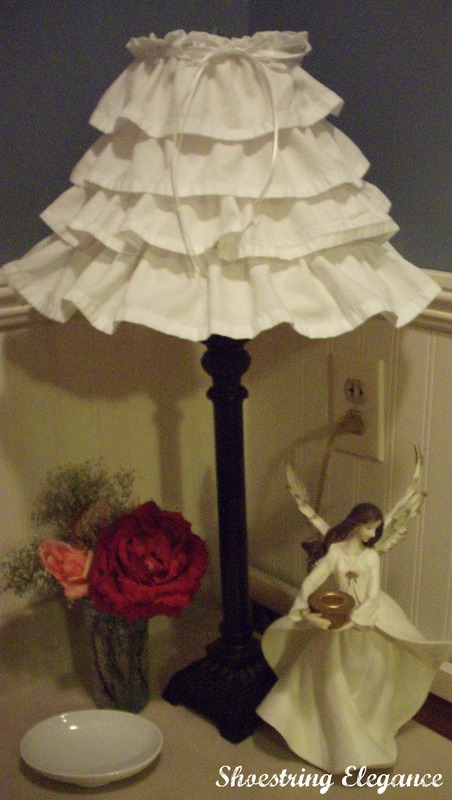 I simply made more Ruffles and attached 4 layers of them to my old lampshade pictured here above right. And Voila! 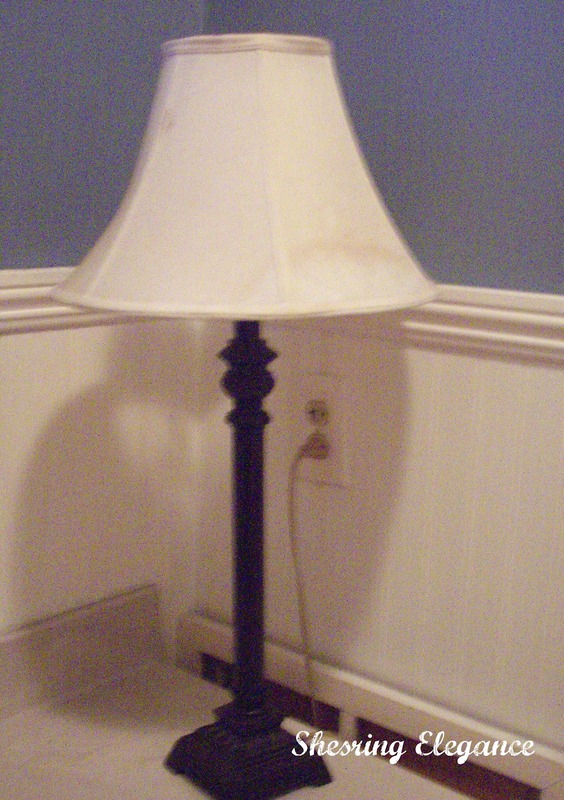 Isn't this the cutest little shade you ever seen? On the top ruffle, I turned the top of the fabric down about and inch1/2 to created the little Ruffle you see at the top! Then, of course, I had to finish it off with a simple little satin bow. What do you think? All in all, I am very happy with how this turned out and I dare you to beat the price!!! FREE!! I simply made 3” Ruffles, from leftover material, attached them to my lampshade, with a my handy-dandy glue gun(this shade was headed for the garbage, anyway) and then topped it off with a little ribbon I had laying around the house! 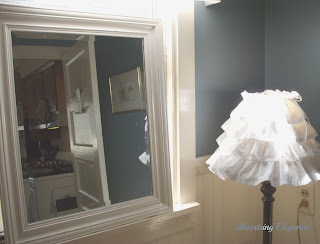 If you have a lamp in your Bathroom, as I do, covering your shade (anyway you like!) 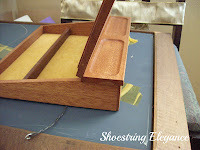 Is a quick, simple, easy and inexpensive way to bring some more elegance into the room! Not to mention the money you save!! I hope you all have a Wonderful day full of God’s Blessings! Let me know what you think and visit these other sites below for even more great inspiration. Good morning, Friends! Happy Saturday morning to you all! Happy Cinco de Mayo!! 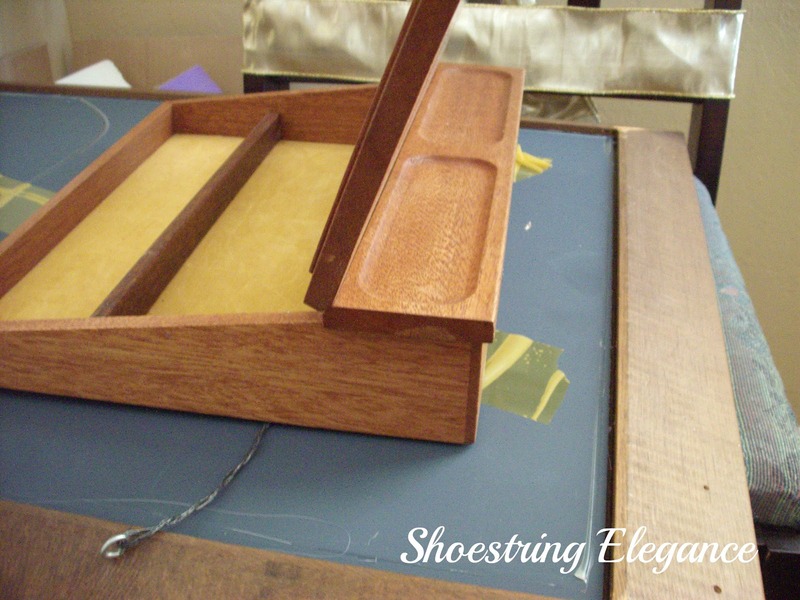 I've been working on a few projects to share with you. I hope to have them ready to post up here tomorrow or on Monday. I’m having a blast making them, too!!! But, it is time consuming. But who cares, I do get to share them with you and reap the rewards of my labor!!! If you have been following Shoestring Elegance you may remember last week when I shared a picture with you all of my first Peach rose of the season. Well, you guys are just not going to believe what has happened in one week. 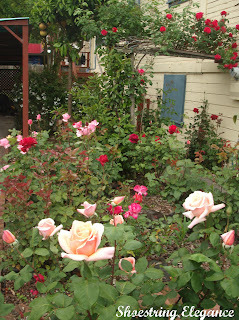 My entire rose Garden has come to life right in front of my eyes!! I just had to take a minute to share it with you all! This is an image of my garden yesterday morning and the rose in the front was the one featured...I can't even count all the roses now...Life is so sweet and God is so Good!!! I hope you all have a fabulous weekend, and getting a chance to enjoy your garden!!! Okay, a quick technical note, because you asked. If you are trying to post a comment here and have been unsuccessful, this may be the reason why: you, of course, click in the comment box and write what you like! Here’s the tricky part under that box you will see a little pull down box it reads Comment as: ….In the box it says Google, AIM, Wordpress, etc.. suggesting the type of account you are viewing it from, CLICK on the one that you have account with, if for some reason yours is not represented there you can always choose anonymous…You can tell me who you are, if you like..Once that is done you need to click on the PREVIEW box, if everything appears as you like it then click PUBLISH!! That’s all there is to it, really!!! I look forward to reading your comments and finding out what you are doing this weekend. I will post my NO COST project for you all to see tomorrow!! Enjoy! !